Black Lotus Casino brings you some great end of month bonus busters in the Zap Wins promotion. Enjoy the end of month madness with great bonus and free spins offers. The weekend begins with a 90% match deposit bonus offer up to a total of $250. Redeem the offer with the bonus code BLASTSPARK. In addition to this, get 40 free spins on the Captain Shockwave slot game. Unlock the free spins with the BLASTSPINS coupon code. Next up is a 95% match deposit bonus up to a total of $250. The bonus code WARRIORWIN unlocks the bonus offer. Release 30 free spins on the Tanzakura slot game at the same time using the coupon code WARRIORSPIN. There is one more great bonus offer available this weekend. The final offer is a 100% match deposit bonus up to $250. Redeem the 100% match bonus using the VIKING2U bonus code. Along with the bonus, there are 20 free spins on the Vikingdom slot game. Redeem your spins with the VIKING4U coupon code. Newbies at Black Lotus Casino have much to look forward to. First play through the top notch Welcome Bonus, and then get ready for more. The Daily Promos and Happy Hour Free Spins keep players busy, as does the exclusive for VIPs $10,000 Cash Vault. In addition to this, there are plenty of special promotional offers throughout the month. New players get a Welcome Bonus valued at up to $2,300. 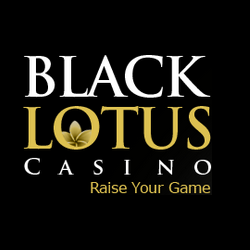 You can also triple your first deposit at Black Lotus Casino. Make sure to use the LAC500 bonus code for this special Welcome Bonus offer. Start the week off with a 100% match bonus on Monday Mania, along with 20 free spins on Wild Berry. Tantalizing Tuesday brings with it a 75% match bonus and 20 free spins on the Legends of Olympia slot game. Whopper Wednesday has a 90% match bonus for you, along with 20 free spins on Gems n Jewels. Thunder Thursday storms in with an 80% match deposit bonus offer. You also get 20 free spins on Sweet Success. The weekend kicks off with Fantastic Friday’s 80% match bonus and 20 free spins on Captain Shockwave. Next up is a 100% match bonus and 20 free spins on Bucksy Malone for a very Sensational Saturday. Sunny Sunday closes out the week with a 90% match bonus and 20 free spins on the Samba Spins slot. Last updated by Shannon on January 26, 2019 .